Description: KabelSchlepp Conduflex is constructed of a stainless steel shell with a high strength glass fiber reinforced nylon liner to guard cables and hoses from dirt, chips and debris found in machining environments. KABELSCHLEPP flexible conduit, CONDUFLEX, is an extension of our range of energy supply products based on many years of experience in this field. CONDUFLEX flexible conduit is used to guide flexible cables/hoses and has proven to be successful in machine and apparatus design, handling systems and robots, etc. KABELSCHLEPP flexible conduit, CONDUFLEX, consists of stainless steel or black oxide stainless steel segments and frames made from nylon reinforced with glass fibers. The segments and frames are assembled to form the required length of the flexible conduit which can easily be shortened or lengthened subsequently. 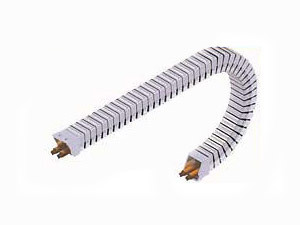 The flexible conduit can be self-assembled to the required length which, therefore, eliminates the need to order to every individual requirement and therefore allows stocking in standard length sections. Partly damaged flexible conduit does not need to be replaced but can easily be repaired! CONDUFLEX is available with different bending radii. 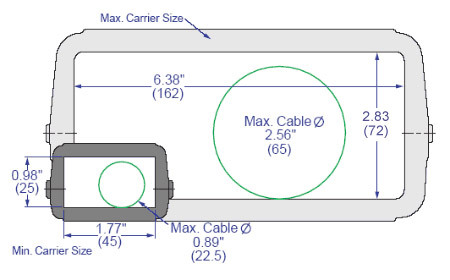 The bending line lies along the neutral axis of the flexible conduit so that the movement of the cables and hoses relative to the CONDUFLEX is minimal. The cables/hoses which are housed within the CONDUFLEX are protected by the plastic frames. CONDUFLEX flexible conduit is available from stock.